2016 marks 30 years since the creation of Glyndebourne’s education department. Here we look back at three decades of pioneering work, which continues today. While the roots of education work at Glyndebourne date back to the 1950s when the company performed in Lewes prison, it was not until 1986 that the education department officially sprang to life, led by Katie Tearle. Katie Tearle in an Albert Herring workshop, 1986. Photo: Guy Gravett. Set up to complement Glyndebourne’s touring activities, the department has expanded to become a year-round operation and is responsible for a large percentage of our new commissions, many of which are performed on the main stage. Across three trailblazing decades, Glyndebourne’s education work has enabled more than 3,000 amateur singers and instrumentalists to take part in performance projects, seen commissions for 32 different composers and won four prestigious awards. Work with schools has been at the heart of education activity from the start and continues today with regular Performances for Schools, which have introduced more than 30,000 children to live opera since 2006. A Performance for Schools at Glyndebourne. Photo: Sam Stephenson. 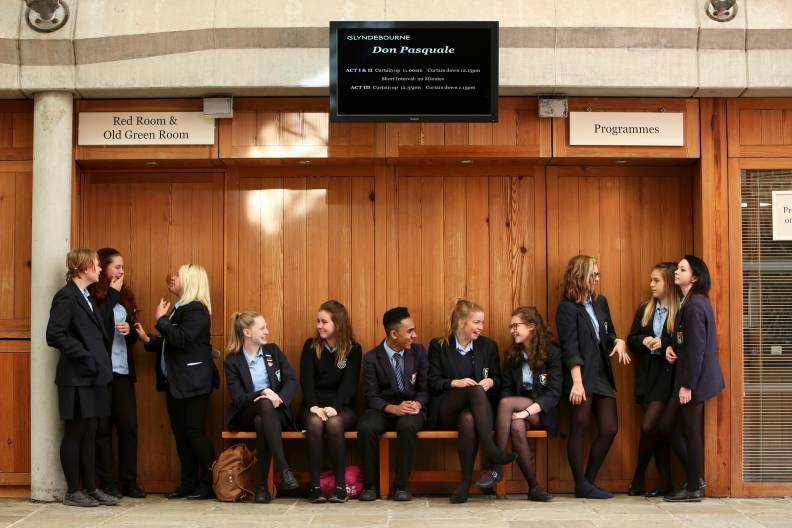 For Glyndebourne Festival and Tour audiences, first-hand experience of the work of the education department might first come from pre-performance talks and events. Other people from the local community might get involved through Raise Your Voice, a long-running programme for dementia sufferers and their carers that provides access to the life-enhancing benefits of singing and opera. Looking back, one strand of work stands out as truly pioneering. When Glyndebourne undertook its first full-scale community opera Hastings Spring in 1990, community opera was still in its infancy, making the project one of the most ambitious undertaken by any opera company in the country to date. The first in a series of site-specific community opera projects with composer Jonathan Dove, the production featured over 250 amateur performers from the local community and took place on Hastings Pier. Fittingly we’ve been back in 1066 country this year to help deliver a brand new community opera, PUSH. Hastings Spring, 1990. Photo: Tom Fenn. Hastings Spring was the first in a long line of ambitious and exciting participatory opera projects that includes Zoë (2000), Knight Crew (2010), Imago (2013) and, earlier this year, Nothing. 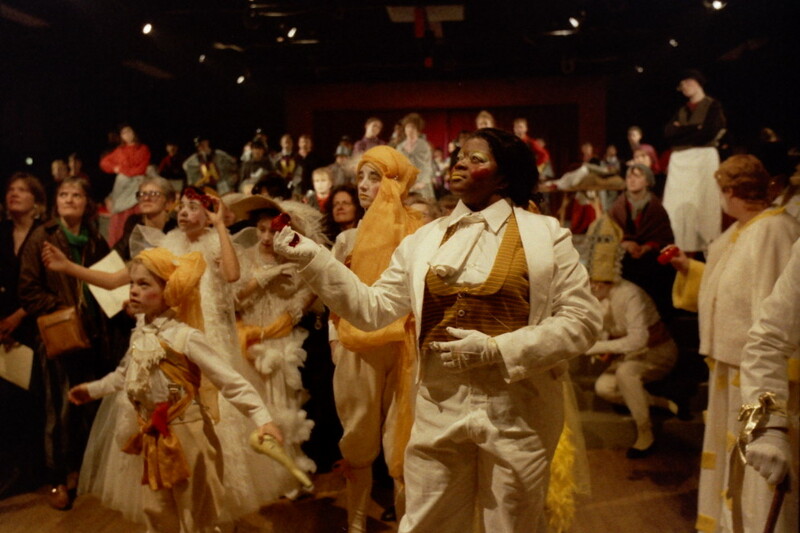 The success of another of these community operas, 1997’s Misper, led to the formation of a youth opera group, now known as Glyndebourne Youth Opera (GYO). 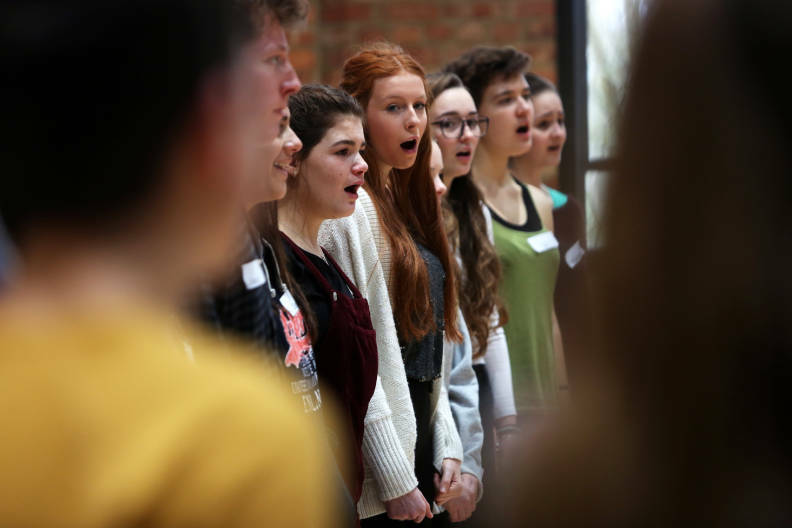 Offering local young people the chance to take part in opera workshops and performance projects, GYO is the bedrock of Glyndebourne’s efforts to nurture local talent, providing participants with the skills and experience needed to pursue professional training should they wish to. Glyndebourne Youth Opera workshop. Photo: Sam Stephenson. The world premiere of Nothing, a new youth opera by composer David Bruce and librettist Glyn Maxwell performed by 43 members of GYO alongside five professional singers. Talented young instrumentalists played alongside Southbank Sinfonia in the orchestra pit. A hit with audiences and critics, the production was the perfect start to the anniversary year and has just been shortlisted at the 2016 British Composer Awards. The launch of two new awards for young singers, the winners of which were announced on 15 October. The production of new community opera PUSH, composed by Howard Moody and directed by Simon Iorio, in partnership with Battle Festival. The performance of A Garden Dream by Lewis Murphy, Glyndebourne’s Young-Composer-in-Residence, by members of Glyndebourne Youth Opera during the long interval at three performances of the 2016 Glyndebourne Festival production of A Midsummer Night’s Dream. The appearance of four GYO members in the 2016 Glyndebourne Festival production of The Cunning Little Vixen, following successful coaching in preparation to audition as professionals for the parts. The recruitment of local choirs from across England to sing in performances of Don Giovanni: Behind The Curtain, a new event for Glyndebourne Tour 2016 offering a behind-the-scenes exploration of how an opera is staged. Anniversary celebrations continue in November with a special event for anyone who has taken part in an education project over the past three decades. Register with the Glyndebourne education alumni scheme to find out more. You can read stories from some of those who have already been in touch here. We’re currently in the middle of a month-long social media campaign, sharing highlights from across three decades of work. Follow along and share your memories using the hashtag #30Years30Days on Twitter, Facebook or Instagram.